Ever thought about cycling around Wales? Well, the aim of this website is to put Wales firmly on the world cycling map. To do this we’ve already completed a trans-Wales ride of over 600 miles around the coastline of much of the Principality and now want to encourage other bikers to do the same. In 2005 two lads from Pontypridd, south Wales; Dave Lewis and Derek Goode, cycled the iconic Land’s End to John o’ Groats route and raised over £1000 for Ty Hafan (a children’s hospice in Wales). The ride was a great success, and the two Welshmen joined a special band of brothers who’ve all experienced the highs and the lows of this great, long-distance cycling trip. Fast-forward a few years (11 years to be precise) and one of the riders decided it was time to create a challenge closer to home. This time he’d focus on Wales. 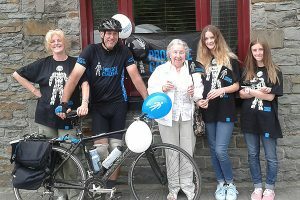 And so in the summer of 2016 Dave Lewis decided to create a new route, this time cycling around Wales to raise money for Prostate Cancer UK. Not quite as far as LEJOG, but just as challenging, especially as he was fifty years old and had only been back on the road bike about twice since 2005! “My dad suffered from prostate cancer but beat it. So as a tribute to him, and the many other people who successfully triumph over this type of cancer I thought I’d test my own over a gruelling two week circuit of the Principality. In addition I also hope to inspire others to repeat the course and help me turn this haphazard ‘loop’ of Wales into a world famous iconic ride just like Land’s End to John o’ Groats. “After completing the ride I wanted to encourage others to do the same thing and so, in Wales’s Year of Adventure, I sent a press release out to the Welsh Assembly Government, Welsh Tourist Board, Sustrans, BBC Wales, Western Mail, SW Echo, SW Argus, SW Evening Post, Ponty Observer, cycling forums, bike shops etc. 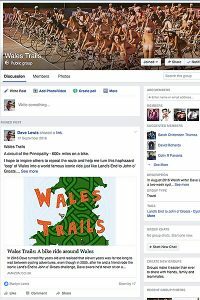 It’s also on Facebook, Twitter, the Wales Forum and many other online resources. What these organisations do with the information I sent them I don’t know? Whether they’ll want to help us put Wales on the map I have no idea? I guess only time will tell. This website hopes to encourage others bikers to take up the challenge and do their own Wales Trails. And so with this in mind we have added a ‘rough’ route, with links to information on the towns and cities you might want to visit, a gallery of photographs that show how stunning the Welsh countryside is, a links page with accommodation options, bike blogs, cycle shops, cafes and pubs, places of interest and links to many other helpful sites. This section will be updated with new information as and when we think of it but if you have a useful website you want us to add please let us know here. If you’re planning on doing a similar challenge then why not help promote the idea of the ride by buying a t-shirt to cycle in or just wear in the pub in the night! 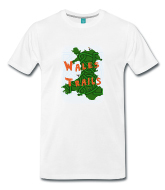 The Wales Trails design can now be bought printed on a white, 100% cotton, premium quality t-shirt from Spreadsheet. This is a top-quality product with a huge range of sizes available (from Small – 5XL). The t-shirt is digitally printed, fair and sustainable, durable fabric (150g/m²) and has a colour contrasting neckband. To learn more about undertaking such a ride yourself why not pick up a copy of Dave’s book, where he outlines his vision that one day, Wales, with its rapidly diminishing yet rich cultural heritage, will soon become a ride that all cyclists will want to do. More than just a guide, but a funny and thought-provoking account of two weeks in the summer of 2016 when one man’s dream becomes reality. 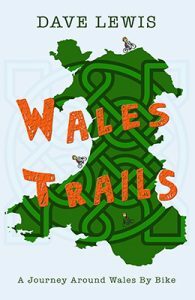 Wales Trails is available from all good bookstores, from Amazon and Dave’s own website as a paperback and e-book. PROSTATE CANCER UK Registered charity number 1005541 and in Scotland (SC039332). We have also set up a Facebook group – Cycle Wales – where other like-minded cyclists can post details of their own rides, charity events and crazy adventures too. Click the image and join the group. Free to everyone. Promote your ride, post links to your websites, ask questions and tell us all about your trip. Note: You’ll need your own Facebook account to join in of course. To check out our blog page – click here.